We all have our Gio stories: some personal, some public; some good, some bad, some “please don’t remind me.” Here are mine. I first encountered him in Viera. 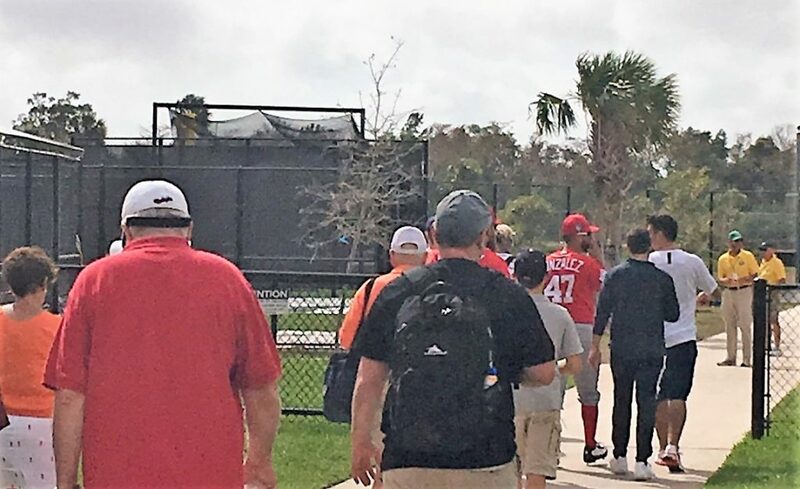 He was easy to spot in Viera or West Palm during the spring training drills: just look for the player who is completely out of step with everyone else, or talking when everyone else is following the drill leader. When he finally (on about the 10th try) got a bunt into the practice bucket, he took a bow—to the applause of fans and teammates. Even Matt Williams and his air horn couldn’t keep Gio from marching to the beat of his own dyslexic drummer. (In the photo, Gio is off to the left, chatting, while the rest of the pitchers are watching the drill). Whoever the genius was who put Gio’s 2016 spring training locker next to Papelbon’s deserves a medal. Dusty was quoted as saying he didn’t have to get on Gio’s case about doing the drills because Pap would make Gio do a drill over (i.e. covering first) if he didn’t do it right. I wouldn’t have believed it if I hadn’t seen it myself: Gio and Pap walking together between the fields in Viera, Pap getting on Gio’s case if he wasn’t focusing on the task at hand. I risked twisting my ankle running across the old fields at Space Coast Stadium to get a photo of them together. At West Palm there are real sidewalks so chasing Gio wasn’t so difficult. But as always, when he was supposed to go between the fields he was in with the fans, not using the player walkways between the fields. Gio gonna Gio. Gio is listed at six feet, zero inches. I do not believe that is possible, unless you count cleats and hat. The last time I spoke with him was at the ZiMS Foundation fundraiser. Everyone was crowding around the players who were in attendance, mostly for selfies. When it was our turn with Gio, he was good-naturedly ready to pose, but we said “No, we want to see photos of your kids.” He just lit up, grabbed his and his wife’s phones, and showed us the cute photos. I’d rather remember him that way than his 5-inning, 6-run last performance at a National in Philadelphia. At least he won’t be pitching against us in this homestand . . . although I think we’d have a good chance of winning that game because Gio can really get in his own way—and pitching in his long-time home stadium as a visiting player right after a trade would mess with anyone. Will I miss him? I don’t think so: at least not as a pitcher. How many times have we heard Charlie and Dave say “He had him 0 and 2 . . . and he walked him.”? Too many. 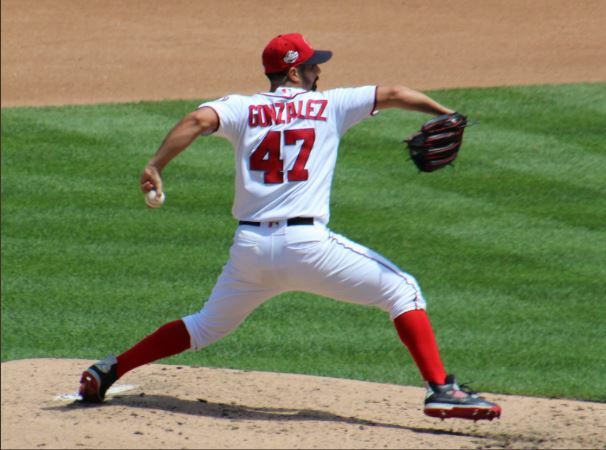 But I’m sure that if Gio does come back at some point as a visiting pitcher, the Nats fans will welcome him. We’re not Philly.